And we’re back. The cars look (a bit) different and sound (a lot) different, but the Formula One circus is go. So much for all the cars breaking down, and no-one going out to practice. There’s a fair bit of data, and most of it looks to be reasonably consistent. The gap from front to back on headline times was about five seconds, with 13 cars within 1.7s. The race data looks to be quite a bit more spread out. In comparison with Free Practice 2 last year, the race pace of the fastest car is about 1s slower, and the relative effects of fuel and tyres look to be pretty similar. Which means that if the fuel effect is about two-thirds of last year (100kg to 150kg), then the tyre degradation is also about two-thirds of what it was last year. There is some evidence of tyre degradation, especially on Massa’s very long stint, but generally the tyres look pretty well behaved. Can’t see anyone wanting to stop more than twice. So – to the pace. Most of the cars did a nice consistent stint to assess, but there is nothing from Caterham and Maldonado, and Gutierrez didn’t string anything useful together. Grosjean is interesting – he did three laps (of four) at a good pace, but whether this is really representative of the race is a big question. It is reasonably rare to see this outside of the race work, though. 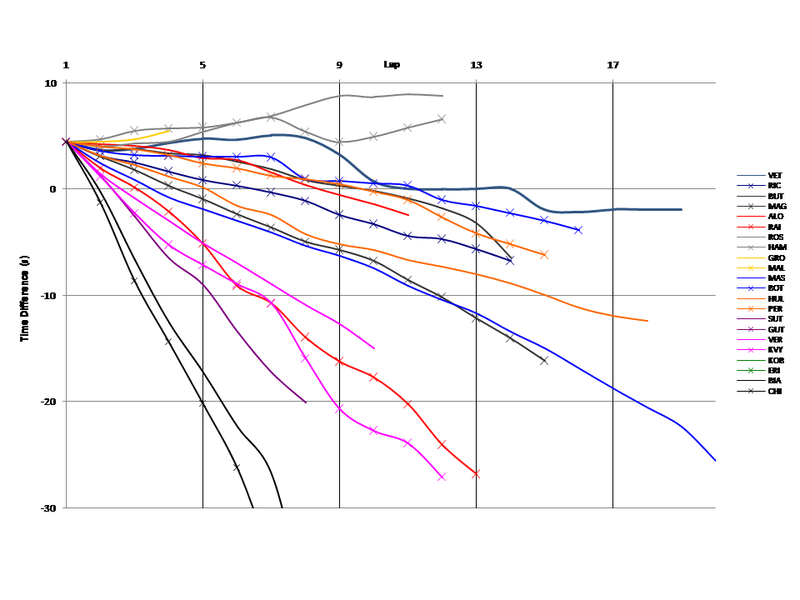 As last year, I have plotted the most relevant stint of each car on a race history chart – some obviously irrelevant laps have been deleted. If we imagine the top of the chart as a car being chased, if the trace representing the line is going up, it is catching this car; going down it is falling back. So the fastest cars will end up at the top of the chart, the slowest at (or off) the bottom. And what do we see. Well, running down the order at first glance we don’t see quite what we might have expected. Mercedes at the top, yes, but then Grosjean (surely this isn’t real?) and Vettel (bet this is real). Then we have Bottas, Perez, Button and Alonso. Interestingly, the Ferrari starts out as the fastest of this group, and ends up the slowest. Whether this is tyre use, engine settings or anything else is something we just cannot know. It is also interesting that apart from Mercedes, whose drivers are pretty much equally matched, Force India and Toro Rosso, there is a pretty big gap between the drivers from each team. There seems to be between 0.7s and 1.3s between drivers, this would give about 1s difference between the compounds in race pace, but it could also be engine mode, or even (whisper it) the driver. Favourites have to be Mercedes, as expected from testing. But then, well, it could be anyone. The consistent runs from Vettel and Bottas suggest that they are the most likely to challenge. Force India are thereabouts, McLaren are thereabouts, and Ferrari are in this battle although the fading pace has to be a concern. Toro Rosso are a little adrift, but nowhere near as badly as Sauber, who appear to be in a fair bit of trouble. Disappointingly, Marussia are way back – I had hoped that they would be closer than this. As you may remember, I too have a analysis model that works on the same data, tries to reach the same conclusions but goes about the numbers differently. Even if there have been differences in the past, both data analysis seem to concur with pretty much every aspect. The Mercedes are at the front but have shown that in a less evident way (less laps). Vettel seems to be on their heels. Bottas is my biggest surprise, capable of a rhythm that closely follows Vettel’s. Massa doesn’t seem to match that. But there may be some Williams resurgence after all! Neither Ferrari seem very strong and appear to offer merely midle-pack pace. In fact, Ricciardo, Mercedes and Force India seem closely matched and ahead of the Italians. For the race, I’m expecting an improvement from Ferrari. Something small can make them catch up with the Red Bulls and Williams. And I doubt the Red Bulls are going to make it to the end of the race at full throttle. So the podium might fall in to Mercedes, Williams and Ferrari most likely. Yes – Ferrari seem to be better on one-lap pace, so I think they’ll start near the front. Maybe we’ll get to see if track position is important in 2014. I had expected better race pace though. Hi – I like your model and your analysis. I am a Statistics Student from Germany. I love F1 and Statistics and i would therefore like to calculate a model my own. I tried to find the practice data but i cannot find a source. I would be very glad if you could tell me where to find this data. If you look in the Timing Information (you have to click on the down arrow) then you should find PDF documents of the laptimes. Grateful that you are providing the statistical data that obviously couldn’t be seen by the public except that we presume Mercedes to be the fastest. Button said that Mercedes is 1 sec ahead of the flock and except for Vettel, your analysis seems to fit his description. I am surprised that Ferrari is so off the pace, which honestly I wouldn’t know until I see your data. I agree on Grosjean – but I do wonder if there is some pace in the car. The Mercedes stints are both interesting. There is a consistent pace for both – which is identical for both cars. But they both also have some laps at slower pace – which looks consistent enough to be a different engine mode. Only Red Bull and Williams were really consistent throughout of the faster teams. I did wonder – I expect Massa to be in the mix for the podium. So glad that you are back!! Thank you for all the work! Brilliant, really glad you found time to do some analysis. Great read, excited to see how it all pans out. Thanks!Always counted on your posts last year – will this year too! Glad you are back. hope that you can find the time this year to give us this great information and of course your helpful comments. Qualification was a exiting start of the season. What a strange first race. I hope your datamodel can explain some more. How could Rosberg set the fastes lap in lap 19?? And also Riccardo drove almost the same lap times at the end as he drove during lap 20. It looked like massive fuel saving during the race. I think Lewis his engineer switched to V5 to early he should have waited a few rounds like Nico’ s engineer. It al looked slow for me maybe also because the new sound.